Tim Tebow, the former Denver Broncos quarterback who was recently traded to the New York Jets, paid a visit to Broadway this weekend, attending a performance of the hit musical “Wicked” at the George Gershwin Theatre. The football player attended Saturday night’s performance of the show, according to a report in the New York Daily News. He slipped into the theater about five minutes before curtain and was escorted out of the theater’s back door. “Wicked,” a prequel to “The Wizard of Oz,” opened in 2003 and has played more than 3,400 performances on Broadway. The show has also toured the U.S. and internationally. Tebow, 24, has become famous for his habit of praying on one knee during football games, an act nicknamed “Tebowing.” The athlete has become the talk of New York since he was traded last week. The Associated Press reports that the famous Carnegie Deli is naming a sandwich after him. 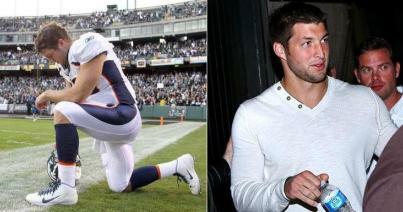 Tebow pulled off a nifty QB sneak on his way into the theater, slipping inside five minutes before the 8 p.m. show time. Then, he headed straight for his seats in row L in the orchestra. His arrival went largely unnoticed by the audience. Afterward, Tebow went backstage to congratulate the stars. He told them it was his first ever Broadway show. Chandra Lee Schwartz, who has a leading role as Glinda the Good Witch, said Tebow was “very sweet.” “He seemed to enjoy it,” she said. This entry was posted on Wednesday, March 28th, 2012 at 10:11 am	and is filed under Uncategorized. You can follow any responses to this entry through the RSS 2.0 feed. You can leave a response, or trackback from your own site.